The naturally sweet flavor and soft texture of sweet potato meld delightfully into this dressy crème brûlée. Bake in ramekins, then gently spoon out and serve in stemware. Preheat oven to 325ºF. Bake sweet potatoes in oven until tender, about 1 hr. Peel sweet potatoes and puree until smooth. 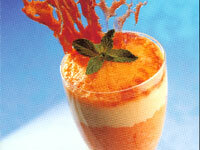 Combine sweet potato puree, 1⁄4 cup sugar, sour cream, and lemon juice; mix well. Butter 10 (7-oz.) ramekins and sprinkle with sugar. Spoon 1⁄4-in. layer of sweet potato mixture (about 3 tbsp.) into each ramekin. Set ramekins in 9x13x2-in. baking dish; set aside. In a saucepan, combine whipping cream, 3⁄4 cup sugar, and vanilla bean. Bring to a boil, stirring occasionally. Remove from heat and stir in vanilla. Mix egg yolks with remaining 3⁄4 cup sugar. Blend hot cream mixture into egg yolk mixture. Fill ramekins with egg and cream mixture. Place baking dish in the center of the oven set at 325ºF. Pour enough hot water into baking dish to come halfway up the sides of the ramekins. Bake 55 min., or until a knife inserted near the center comes out clean. Cool ramekins on a wire rack, then chill in the refrigerator. To make decorative golden sugar garnish, heat an additional 1⁄2 cup sugar in a small, heavy skillet over med. heat until melted. Drizzle onto a lightly buttered baking sheet with a fork. Let stand until cool. Break into large pieces. To serve, sprinkle ramekins with sugar and place under the broiler to brown. Spoon crème brûlées into stemmed glasses and garnish with golden sugar pieces.